In Vine Land, when there are new bottles showing up on a fairly regular basis, it’s comforting to just have a couple of selections that I know will work. I’m not always in the mood to crack open something new, believe it or not. 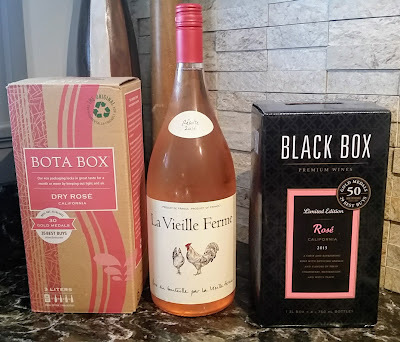 Some wines are comfort food – solid, unspectacular offerings that don’t cost much and are flexible enough to go with just about anything. Here at the ranch, one of our house wines is an Italian red called Montepulciano d’Abruzzo. Montepulciano is our normal red table wine. Simple, fruity, medium-bodied and straightforward, a glass of Montepulciano d’Abruzzo is like watching an old episode of Seinfeld. I know exactly what to expect, I can enjoy it without paying too much attention, and I don’t have to search hard to find an open episode. The fact that it’s around $10-12 for a 1.5 liter bottle doesn’t hurt, either. Not long ago, I got a note from Maggie at Colangelo, offering me a pair of bottles of wines from Masciarelli, an estate winery in Abruzzo credited for “placing the central-western region of Abruzzo on the Italian wine map” with its production of acclaimed wines. These include my old friend Montepulciano d’Abruzzo, a version of which is considered Masciarelli’s top-line wine. Nothing against my good ol’ table wine, but I was very curious to see what a “high end” Montepulciano d’Abruzzo was like. A bit of a geography lesson. Abruzzo is a rather mountainous region of Italy located about “mid calf” on the eastern edge of The Boot, directly opposite Rome on the west coast. The grapes most widely grown in the region are Montepulciano for reds and Trebbiano for whites. Thus, Montepulciano d’Abruzzo is wine from Abruzzo made from Montepulciano grapes. I state this explicitly because there’s a town in Tuscany also called Montepulciano, well known for crafting some of the better Tuscan wines, specifically Vino Nobile de Montepulciano, which is actually made from Sangiovese grapes. There is no known connection between the town and the grape. Just one of those linguistical quirks of Italian language and history, much like why most English-speaking outsiders can’t correctly pronounce the name of the Kentucky city Versailles. Two bottles showed up for sampling – one of each color. 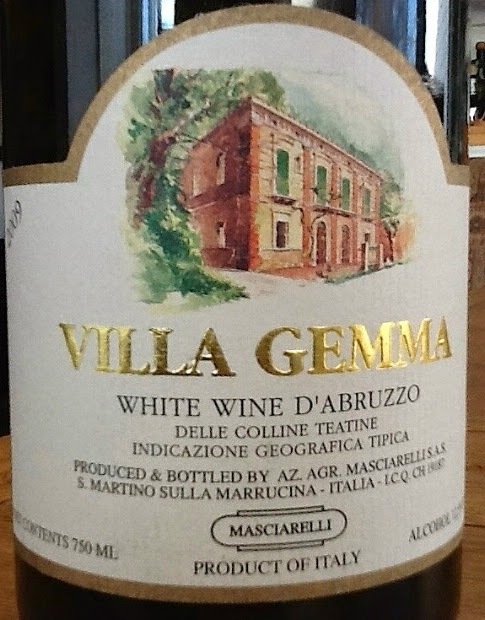 I started with the white, the Villa Gemma 2014 Bianco Colline Teatine. This wine is a largely Trebbiano-based blend, with small amounts of Chardonnay and the indigenous grape Cococciola added. Most Italian whites I have these days tend to be on the lighter side and minerally. Not so here. This wine has some depth and creaminess, along the lines of a French Rhone white. I found it much more fragrant than many Italian whites, with some apple blossom notes up front. Medium bodied, it’s got rich apple and pineapple flavors on the palate, with a delicate, creamy finish. We quite liked it. As with most Italian whites, fish is a safe bet, so we did a simple slow-roasted salmon with some roasted veggies and couscous on the side. A steal for a wine you can snag for under $10. 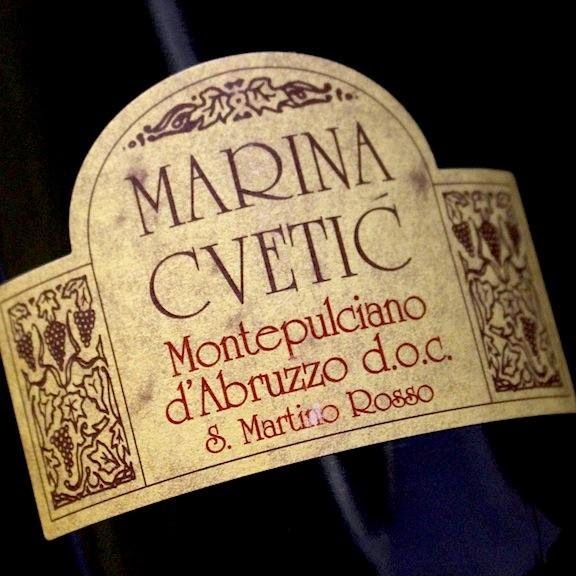 A few nights later, we got into the Marina Cvetic 2010 Montepulciano d’Abruzzo DOC San Martino. Marina Cvetic married Gianni Masciarelli in 1987, and Gianni dedicated his top-line wine to her. She has run the Masciarelli production operation since 2008. While the table version of Montepulciano d’Abruzzo is the very definition of “sluggable red,” the difference in this more “grown up” version was evident from the moment we poured it. The color was much inkier than what I was used to, and the nose of this 100% Montepulciano is full of plums and strawberries. The body is considerable, with dark fruits wrapped up in vanilla and a solid tannic backbone that becomes very pleasant after the wine gets some air. (I’m not used to decanting my Montepulciano!) The finish is evenly tannic with some nice coffee flavors. With a strip steak topped with mushrooms, just outstanding. Also lovely next to evening chocolate. For $20-25, I thought this certainly worth that price. I thought it was great fun to take a second look at a wine varietal I’d taken more or less for granted over the years. Try it yourself. I think you’ll dig.